Q: Where did acupuncture originate? 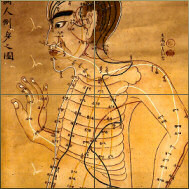 A: Acupuncture has been used in the Far East to restore, promote and maintain good health for over 2,500 years. The first needles were made from stone, and then later from bronze, gold and silver. The first medical text of acupuncture was ‘The Yellow Emperor's Classic of Internal Medicine’, which dates from around 300 BC. A: According to traditional Chinese philosophy, our health is dependent on the body's motivating energy - known as qi - moving in a smooth and balanced way through a series of meridians (channels) beneath the skin. The flow of qi can be disturbed by many factors, physical, mental and emotional: anxiety, stress, anger, fear or grief, poor nutrition, weather conditions, hereditary factors, infections, poisons and trauma. By inserting fine needles in specific points along the channels, April Kim can stimulate the body's own healing response and help to restore its natural balance. Q: Why is the tongue and pulse important? A: To discover how the energies are flowing in your body, April Kim will feel your pulses on both wrists, noting their quality, rhythm and strength. The structure, colour and coating of your tongue also provides a guide to your physical health. The aim is to discover which energy channels need adjusting for your specific complaint to improve and which require treatment to boost your overall energy and vitality. A: You should try not to have a large meal within an hour of your appointment as the process of digestion will alter the pattern of your pulse. You should also avoid alcohol, and food or drinks which colour your tongue, such as coffee, immediately prior to treatment. It is helpful to wear loose , comfortable clothing for your treatment and you should be aware that your acupuncturist may need to access points on your torso as well as your arms and legs. A: Your first consultation takes longer than subsequent sessions. This is because April Kim needs to assess your general state of health in order to identify the underlying patterns of disharmony and give you the most effective treatment. You will be asked about your current symptoms and what treatment you have received so far, your medical history and that of your close family, your diet, digestive system, sleeping patterns and emotional state. Once enough information has been gathered to determine the likely causes of your problems, the most appropriate treatment for you will be selected. A: Acupuncture needles bear little resemblance to the needles used in injections and blood tests. They are much finer and solid, not hollow. When a needle is inserted, the sensation is often described as a tingling, dull ache or a warm feeling. Needles are inserted and left in place for thirty minutes or more, depending on the effect required. During treatment, patients commonly experience a pleasant feeling of relaxation. The benefits of acupuncture frequently include more than just relief from a particular condition. Many people find that it can also lead to increased energy levels, as well as better appetite and sleep, and an enhanced sense of overall wellbeing. A: April Kim uses single-use pre-sterilised disposable needles, which are disposed of immediately after use. April Kim follows stringent standards of hygiene and sterilisation. A: Yes, at least until you have discussed this with your doctor or the practitioner who prescribed the medication. Many people seek the help of April Kim because of dissatisfaction with drug treatment, because it does not seem to be working or because the side effects are unacceptable. DO NOT stop taking any medication without professional guidance. A: This depends on whether you have specific symptoms or whether you wish to use acupuncture as a method of health maintenance. You should contact April Kim who will discuss your condition and answer specific questions. A: This varies between patients. Most people have a course of treatment and usually notice changes after four to six sessions. April Kim will review your progress with you, and carefully monitor your treatment to ensure that it matches your needs. Q: How do herbs work? A: Herbs work by balancing the eight different parts of the body, Yin-Yang, Qi-Blood, Excess-Deficiency and Interior-Exterior. This balance is achieved within the different organs of the body. One organ may be deficient in Yin for example, whilst the other excessive in Yang. A formula is made up of a number of herbs, each one having a specific action. Together they help each other re-balance the mind, body and spirit to achieve a holistic harmony. A: Cupping is the placement of glass cups on specific areas of the body using a vacuum to move stagnant Qi (energy) and detoxify. It isn’t painful and may leave a small mark on the body for a few days. A: Moxibustion is a special herb that’s lit and placed above certain acupoints to draw heat into them. Moxibustion is not painful, just a little warm and is very effective for turning breech babies. Q: What is Gua Sha? A: Gua Sha is a special form of treatment that uses a jade or plastic comb to dredge the meridians. A special oil is applied to the area to help move blockages. It's used as a diagnostic tool as well as a form of treatment to remove blockages in the body. It isn't painful and may leave a small mark for 7 days before fading away. A: Acupressure is the ancient massage art form from China. It involves unique massage and manipulation techniques on tired, tense muscles as well as on specific acupuncture points and meridians. A typical acupressure massage session lasts up to 30 minutes.